Wikus Van De Merwe (Copley) is a government agent whose job it is to move aliens out of a specific shack area called District 9 which has been colonised by aliens known as ‘prawns’. Soon enough, he finds a lot of weaponry stashed away in one of the shacks which the ‘prawns‘ have hidden, one of which is a metallic tube which shoots out black liquid. After a few hours the liquid begins to transform him into one of them, and realising soon enough the aliens have the power to transform him back, begins to band with a few of them in the effort to help them get home. Viewers should note, however, that the whole film is essentially told through a documentary style to start off with to give the general idea of the film’s premise. Then the film begins to become more natural and fluid whilst still giving a ‘factual’ idea to what’s going on, although this change is literally impossible to notice. Given Peter Jackson (who produced it) and Blomkamp’s idea beforehand to make a film version of Bungie’s popular computer game ‘Halo’, before settling to make this, it’s also easy to tell where the battle scenes originate from. And like any other film, they mostly revolve around explosions and CGI, although in some instances blood does splatter across the camera lens. Looking at the film on the whole, originality and realism are the keys to District 9. The plotline is a original concept, one full of moralistic everyday messages about evacuation, invasion and genocide, whilst the realism allows unknown actors to flourish in their roles. Whilst that is good – what is it really in terms of cinema? A Lord of the Rings version of ‘Clover field’ (2008)? Or just another sci-fi film among the giants? I can’t really put my finger on it. 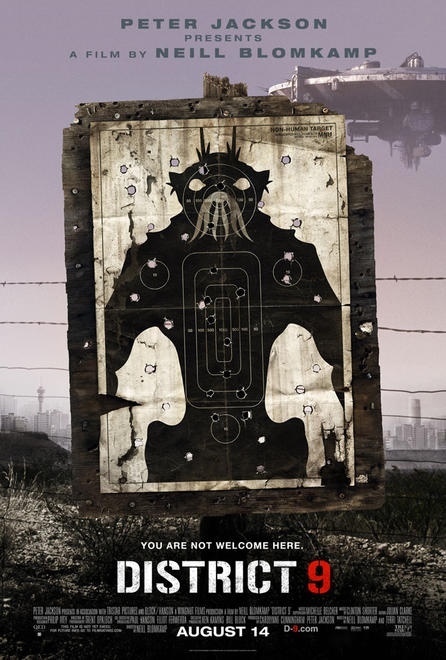 Although predictable, District 9 is a decent sci-fi film and highly enjoyable. In short, easy to understand, believable, good character development and a somewhat ambiguous ending to say the least.